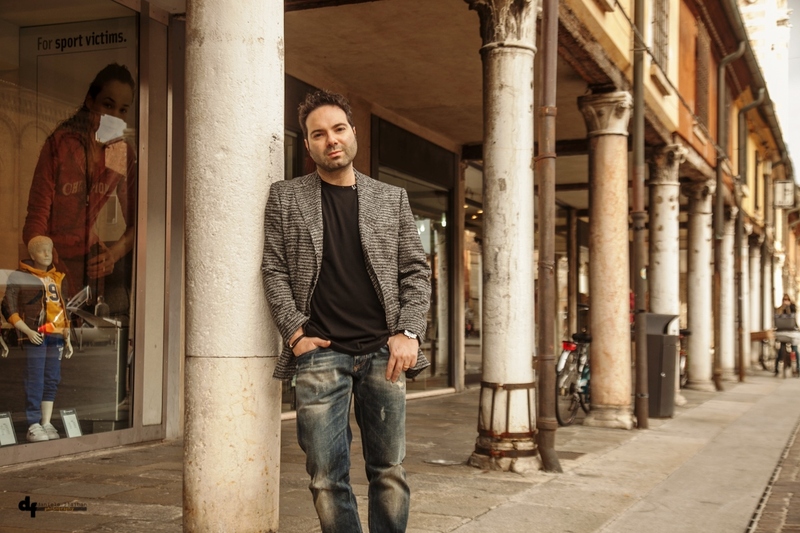 Marcello Simoni, born in Comacchio (province of Ferrara) in 1975, is an Italian crime writer – young, talented and unusual. His thrillers are enterily based in the past, up till now in the Middle Ages. In the last few years, the books of this former archeologist and librarian, became international bestsellers and were translated into 18 languages. As the writer said to Joanna Longawa for Jl Interviews magazine in an interview recorded in October 2016 in Ferrara, “Writing for me has always been a necessity. Since I was 15 I dreamed of becoming a writer, and at that time, I was fond of Gothic and horror fiction“. 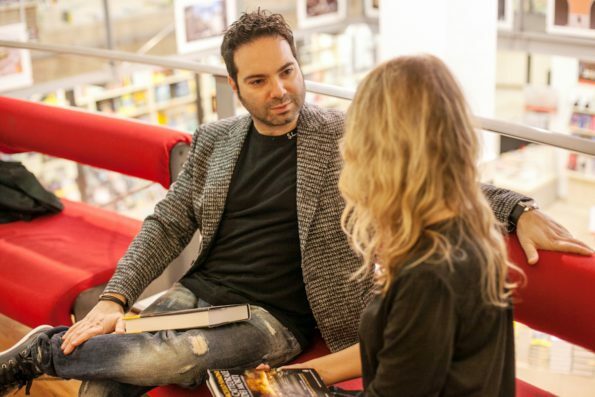 Simoni, compared (by supporters) to Umberto Eco and (by critics) to Dan Brown, with his debut novel, “The Merchant of cursed books“, for over a year topped the world charts and won the 60th Premio Bancarella (2013). With an Italian Editor Newton Compton he has published: “The Lost Library of the Alchemist“, “The labyrinth of the End of the World“, second and third part of the trilogy about the famous merchant, Ignazio da Toledo; “The island of monks without a name“, with which he won the Lizza d’Oro Award in 2013, and “The Cathedral of the dead. The Investigation of Vitale Federici“. In 2014 he published “The Abbey of One hundred Sins“, the first book of a new trilogy, followed by “The Abbey of One Hundred Crimes“ and “The Abbey of Percent of Deception“. Strolling along Ferrara, visiting Castle Estense, Piazza Savonarola and Feltrinelli Bookshop, Simoni shared with us the hidden secrets of the town and his famous books, announcing “The Mark of Inquisitor“, a very new and different thriller, the first one based in 17th century not in Middle Ages, that will come out on the 15th of November, 2016, in Italy and in the following months – abroad. The new protagonist investigator, after the medieval Ignazio de Toledo and Vitale Federici, is brother Jerome Svampa, an inquisitor who lived in Rome and will be drawn into an intrigue of the always misterious Curia Vaticana. Some foreign publishers called you Umberto Eco’s successor,others Dan Brown‘s. Which of these two authors have actually influenced you? In fact, the misunderstanding is quite common. My novels are very different from those of Dan Brown, since they are based enterely in the past, not in the present, like his. Also my books are built on a generally more adventurous oriented plot. Moreover, with all due respect to Brown, I think I’m more prepared than he is in the topic of the Middle Ages and European culture. The protagonists of my books are noir characters placed in a historical dimension and built with greater philological rigor. This precision, in fact, I owe to Umberto Eco. He was the first to demonstrate that it was possible to write about detectives such as Sherlock Holmes, set in a Middle Ages, that can reminiscent of Notre Dame by Victor Hugo. How did your adventure with writing begin? Do you have other dreams? Writing for me has always been a necessity. I need to write. It makes me feel better, especially if I work on narrative. To create intriguing characters and adventures set in bygone eras is such a funny game that I can‘t think of giving it up. But it all started as a hobby. After my first success (The Merchant of Cursed Books) I was certainly not arrogant enough to claim to be a professional writer, and before I convinced myself to leave a job that gave me a fixed salary, as a librarian, I waited to publish my fourth bestseller and at that point I believed I could keep me and my family just by writing novels. How was your character Ignazio da Toledo born? What has inspired you in its creation? Ignazio da Toledo, a merchant of the thirteenth century relics, was born from my intention to create a medieval Ulysses caught between the monastic and the secular world. He is a shrewed traveler and a curious man in a world where curiosity was considered a very serious sin because it lead to rebellion and heresy. I also am a rebel: I do not easily fit in what others imposed on me, I hate uniforming myself to rules imposed by customs and society. I consider myself a free man. Your last Abbeys trilogy has just been published abroad. In which countries is it more popular? In France and Germany, definitely, but I know also that it is appreciated by many Spanish, Portuguese and Polish readers. More generally, I am followed in at least twenty countries and this is the number of foreign publications of my novels. How do you deal with such a great international literary success? How has it changed your life? My private life is a precious thing that I hold on to tightly. I will not let that success to contaminate me, deprive me of my peace or love of my family. As for my job as a writer goes, however, I have to split my time between lengthy writing stages and travel, also abroad, to promote my work. Up till now your books were based in the Middle Ages. Why this period? What in it fascinates you the most? The Middle Ages are a historical period full of suggestions. Settling novels in this age gives me the possibility to talk about great travelers, scribe monks, men of science and shady prelates. The medieval environments are rich: abbeys, universities, castles, but also municipalities and coastal cities. It is not just darkness, therefore, that inspired me to talk about this very long period, which lasted about a thousand years. Doeas the fact that you are an archaeologist help you work on the settings of your books? In what ways is conceiving history more useful to you? Based on archeology I learned about history not only in terms of documentation, but also of the “material culture“. Touching objects from the past, imagining (and rebuilding) the lives of people who they belonged to, was a very important experience for me. I think that to write historical novels it is necessary to go beyond the information that the books explain and “relive” the epochs through which we intend to describe the findings from them. Do you feel more from Comacchio or Ferrara, or more generally, the citizen of the world? I feel as a traveler who sails continuously over the oceans of ink. Writing is a medium that allows me to get away from everything, freeing me up from any parochialism. There are special places linked to a particular place you’d like to reveal in your next book? The headquarters of the seventeenth century Rome, at the time of the Inquisition, and the island of Rhodes, frequented by Florentine merchants of the 15th century. As you see, my brain never stops. What is your conception of good and evil? They are two serpents that are intertwined. For this reason, in my novels completely good or completely bad characters never appear. The human being is always in the balance between light and darkness, is imperfect, divided by instincts and reason. That’s why I consider novels with the knights wearing the white armor very boring. Much better are intriguing meddlesome characters like D’Artagnan. I know that your new and different from the others novel will be released soon. Can you tell me about it? My next novel will be in bookshops in Italy on the 15th of November, 2016. It is a historical noir, entitled “The Mark of the Inquisitor” and will be published by Einaudi Editore, in Stile Libero series. The protagonist is brother Jerome Svampa, an inquisitor who lived in Rome in the 17th century. The plot is built around a cruel crime that took place within a print shop in the Arco Camillian street. The victim, a member belonging to the Congregation of the Index of Bannd Books, is found crushed inside a printing press. Jerome Svampa will be called to investigate, soon finding himself embroiled in a dangerous intrigue of the Vatican Curia. I am very curious if by chance we will see soon a film based on one of your books. Have you already got such a proposal? I have had many proposals, but at the moment I have not yet accepted any. I am waiting for the right producer, one with enough money and intelligence to produce a decent movie or a TV series.